thick bottom panel designed to withstand impact and me standing in it! I weigh 200 lbs! fits underneath N51 table. Should you have two N26 Nilo Bins under table and this unit as well, then this unit will stick out 6″ when pushed all the way up to the Bins when stored and Bins would be flush on opposite side of table. 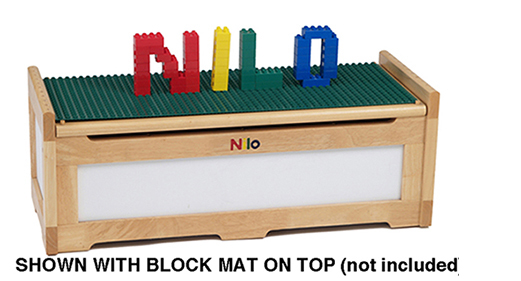 four short dowels on seat top allow placement of our Block Mat for Lego/Duplo® use! holes on rails allow for Hammer ‘N Nail use and other uses as well! this is for both seating and storage. If you want more storage use than we suggest our N26 Storage Bins. Back in the day my wife and I purchased several Toy Chests, Storage Bins. They all failed due to poor construction! The bottoms fell out due to using way too thin of hardboard. The hinges gave way. The wood cracked, none of the items we purchased lasted very long at all. These things all became reasons I started Nilo Toys. 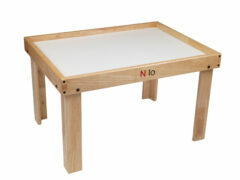 “Quality, Versatility and Value” are the three principles Nilo Toys is founded upon. Quality: Thick solid hardwood. SUPER THICK bottom MDF panel…can support 200 lbs (since I’ve personally stood inside it!). Three hinges instead of two. Two safety hinges instead of one. Thick divider panels. 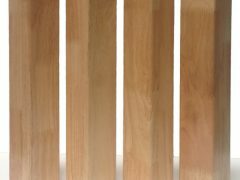 1/4″ thick melamine side panel inlays. Built to last for generations! Versatility: This unit allows for seating two critters side by side. It allows for storage…sporting three dividers and four separate storage areas. It also has four dowels on top to hold/support our Block Mat (sold separately)! This feature allows the Toy Chest to be Lego and Duplo compatible…creates a building platform for your little one(s) to play on! Last, holes are provide in the top left and right side panels. These allow for use with our N95s Nilo-Nails. You hit the nails in AND out….and build Zoobs off of the heads of our nails! Value: With the above mentioned attributes…Quality….Versatility…., comes Value! Wouldn’t you agree? There isn’t a better made, more versatile Toy Chest on the market! It will last for generations! Now, there’s value! A few final thoughts…if you want seating then our N12 Stool may be the best choice. Kids approach seating in a very unorthodox fashion. 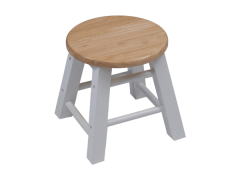 This little stool allows that and its very easy to lift/move around. However, if you are focused on both seating and storage-in-one then our N32 Multi-Toy Chest is the answer. I love this toy chest! I purchased the toy chest along with a large table in dark mahogany 9 years ago when the first of 8 grandchildren became interested in building with Thomas train wooden tracks. It stores a ton of wooden railroad track and accessories, sorted into bins so a particular piece of track or train is easy to find, and rolls under the table for easy out of the way storage. The hinges hold the top open to whatever degree the kids opens it (no closing without someone pushing the top back down). It’s a perfect bench for the kids to sit on and it’s strong enough support a fat grandma too. There’s a small space along the front even when the top is down – along with the top extended over the storage area a bit it’s really difficult for little fingers to find a way to get pinched – so difficult that none of the kids who have played with this from age 3 on have ever smashed a finger on hand. Even if you don’t purchase a table, you should get this toy chest – it’s lovely in the dark mahogany finish. 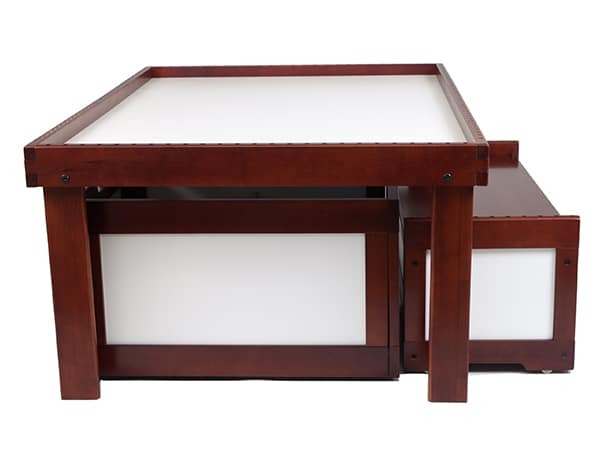 Study chest that doubles as a bench for the activity table. Perfect to go with our train table. Sturdy and stows away easily! beautiful!!! 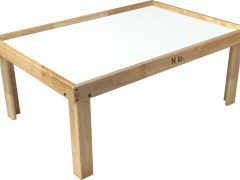 great quality and goes well with table. We purchased this chest in gray. It’s more than a year old now and looks just like the day we revived it. My son is a typical kid so it’s been played with—hard. We use it for storage and have one of the Lego sheets on it. He loves this chest and we do too. I have zero doubt that it will hold up for many years and become an item that is passed through generations.